Join Percy the Caterpillar as he discovers different animals and the sounds they make. Locations include a farm, a garden, the jungle and under the sea. 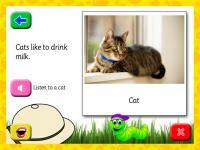 Colour photographs, animal sounds and speech successfully combine to encourage children to progress in a variety of educational games that reinforce ICT skills, together with picture and sound recognition. Spoken instructions make the program suitable for unsupervised use and it is also compatible with touch screens. 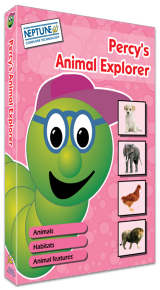 The games enable children to listen to different sounds and work out which animal makes them, find the odd one out, match pictures to sounds, learn where different animals live, complete a simple quiz and discover the sounds and characteristics of the animals. 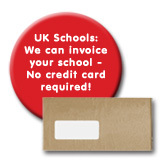 Covers habitats including rainforest, ocean, sea, grassland, woodland, home and garden. Fully narrated for unsupervised learning. Fun activities with an animated reward when the activity is complete. Three levels of difficulty for different ages. 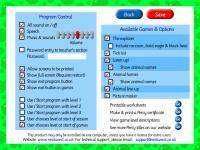 The main menu screen allows easy access to each of the six games and the teacher's section. The explorer forms the basis of this program, illustrating the pictures used throughout. Each animal used is shown in it's correct habitat (including sounds). 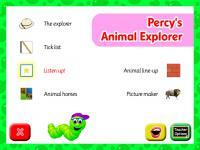 Find the animals that Percy is thinking of and click on it to mark it off the list! In this game, the user must identify the animal by the sound they make. In this game, the user has to take the animal to the habitat it belongs in. 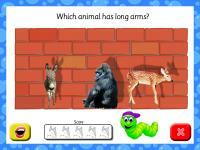 Test your knowledge of animal characteristics in this game and find the animal that Percy is describing. In this game the player must click the arrows to change parts of the picture puzzle to complete the images of animals. The settings section allows you to set the level of difficulty and change a whole selection of other program settings.